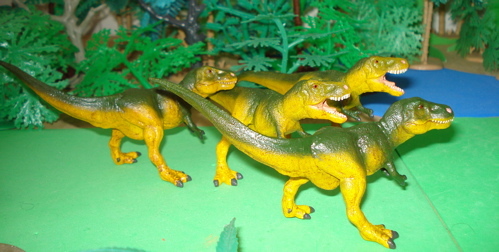 Safari Sue T Rex Dinosaur toys. 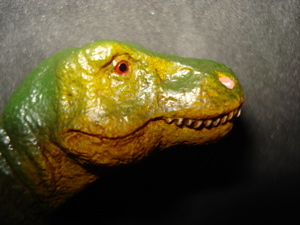 2004 saw Safari Ltd. team up with the Field Museum of Chicago to create toy replicas of their prize fossil, a Tyrannosaurus Rex fossil named SUE. 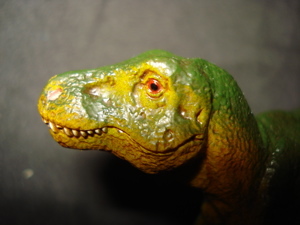 "Sue" is the largest and most complete fossil T Rex Dinosaur yet found and to honor (and, incidentally to capitalize on) her the Field Museum/Safari Ltd. produced a pair of relatively small (five and one half inch, 5.5", 14cm) Tyrannosaurus Rex figures. One with its mouth open, the other with the mouth shut. 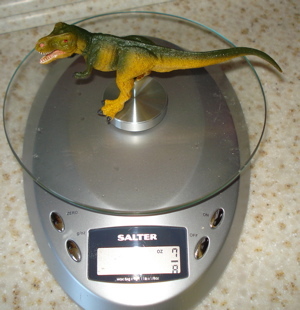 Weighing in at seven-eighths of an ounce (.875 oz, 25 gms) little SUE makes a big splash in the world of Dinosaur toys. Despite being smaller than most contemporary T Rex Dinosaur toys her detail is excellent (especially for her size) and she fits right in with vintage figures such as the vintage Marx and MPC Dinosaur toys series. In addition SUE was produced with a pair of her own, personalized prey, in the form of a gorgeous Anatotitan and terrific Torosaurus (below). lots of personality and good looks. 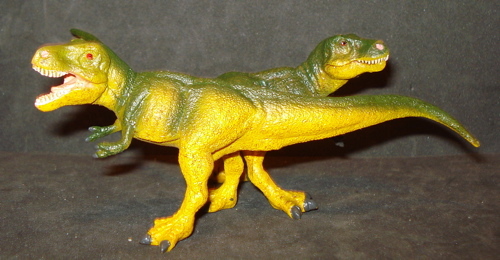 In either configuration there is a lot more detail than anyone would expect from a 1/90 scale T Rex Dinosaur toy. Yes? My preferred member of the pair (Above) is the one with the open mouth and there is surprising detail to be found in that mini-maw. 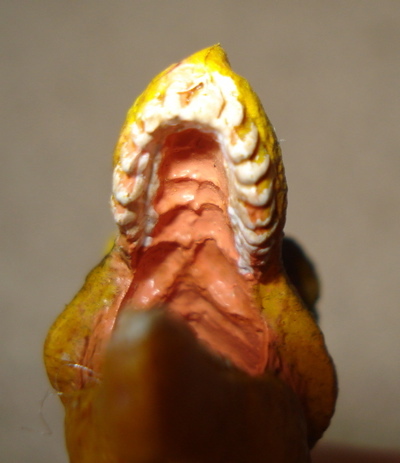 In addition to the expected teeth(s) there is a tongue and a detailed palate as well. Nonetheless a pair is the proper purchase. 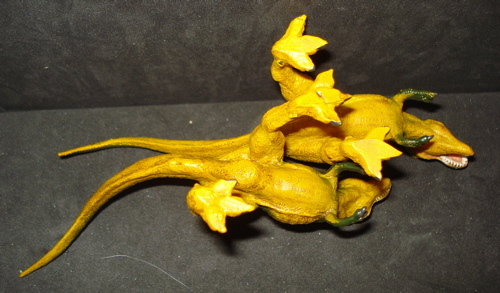 Sue's little arms (left & below) are very well done and show a surprising amount of detail. More, in fact, and better done than those of many larger scale Tyrannosaurs including the better known and much larger Carnegie Tyrannosaurus Rex. 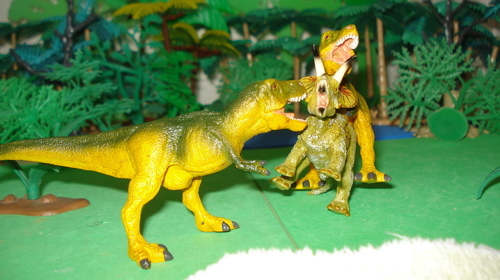 The "shoulder joint", where the arms connect with the body, are much better done on these two than they are on the older, green, Carnegie Tyrannosaurus, as well. And just in case you were wondering.... The feet haven't been forgotten either. So from head to foot we have quite the little predatoy. "Excuse us. We're doin' somethin' here. Okay?" 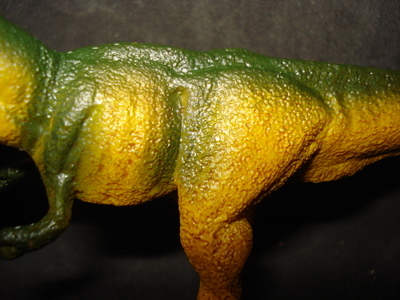 The "body" of the Safari SUE T-Rex Dinosaur is molded in a dark-yellow rubber with (hand painted) green uppers. The eyes are red, nostrils and mouth pink, white teeth and the claws a dark gray/black. 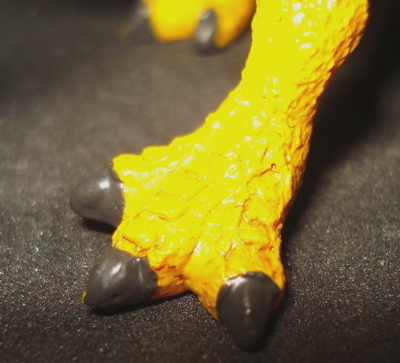 The detail of the skin done simply by roughening of the surface, showing the underlying musculature and bone where appropriate, including the rib-cage and (as seen earlier) scales on the feet. 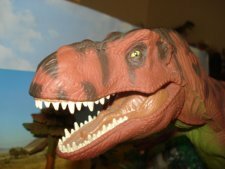 A delightful (if such a word can be used to describe even a T Rex Dinosaur toy) discovery in this T-Rex Dinosaur is that it is made of a comparatively softer rubber than most. While "SUE" is sculpted to stand on her own TWO feet she can get bent a little out of shape and lose her balance. 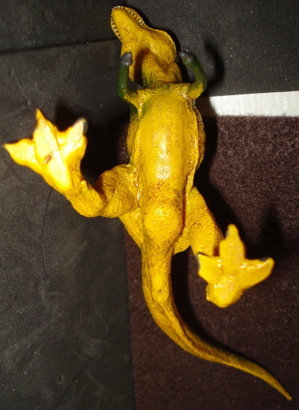 This can happen for any of a number of reasons with any of the bipedal Dinosaur toys. SUE is especially easy to correct, however, due to the softer rubber. You can just bend the feet back to a proper balance with no need for hot water or anything else. And she stays corrected! 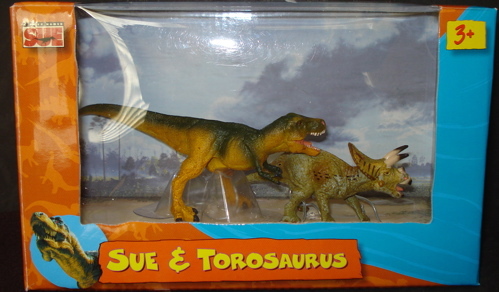 There are two ways to purchase SUE. She can be bought individually, in a little plastic bag, with a tag that says "A T-Rex Named SUE" (mouth open) or (mouth closed), depending. When you buy Sue in a gift box you will discover that her feet are wired to the box to prevent easy removal by the felonious, which will carry over to you as well. Even with care, removal can lead to one of those situations in which Sue's balance is compromised. 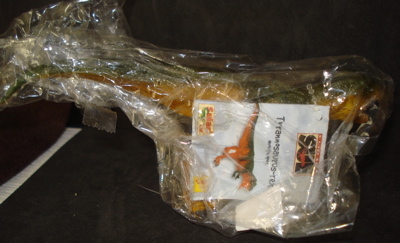 This is a marvelously adjustable T Rex Dinosaur toy, however, so not to worry. 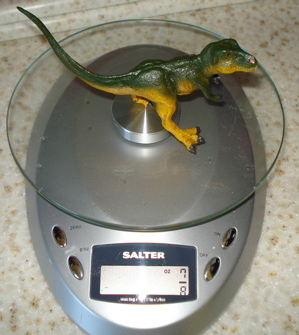 The fact that Sue comes (or can be had) with two pre-sized potential victims ameliorates the fact that she is so much smaller than the majority of contemporary high quality Dinosaur toys. "There's nothin' to see here. Just move along." 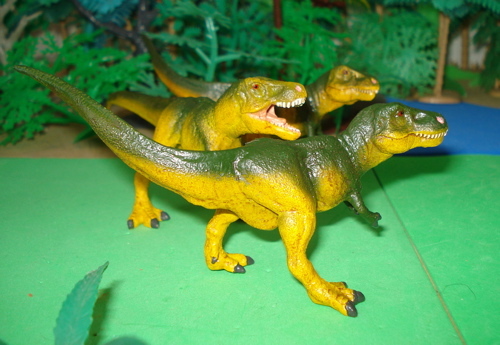 The proportions and the detail of these wonderful little T Rex Dinosaur toys are really superb. That they fit in so well with the old, vintage Marx and MPC Dinosaur toys is an added plus for either play, display or diorama making. 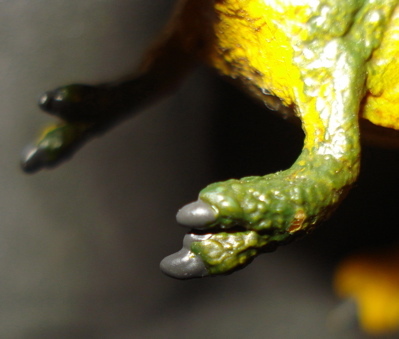 feet are basically just flat with no particular details apart from the separation of the toes. "Now we can get back to our mugging in peace. Okay lunch-meat, let's have your lunch money." 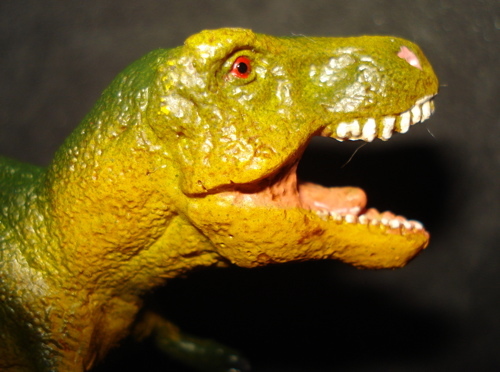 which have "Field Museum Sue T-rex (mouth open/or/mouth closed), 2004 Safari Ltd Miami, FL Made in China CE." 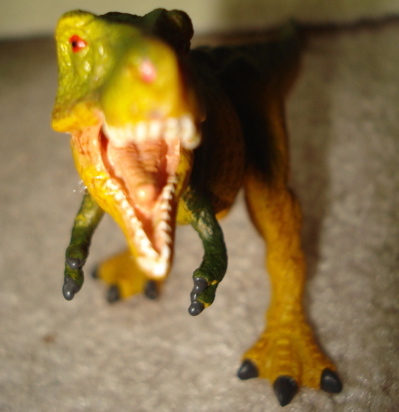 Which largely concludes our visit with this small but world-class T Rex Dinosaur toy. "If we're gonna conquer the world we gotta know what it looks like." 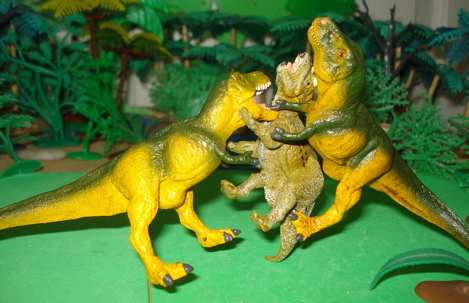 These little T Rex Dinosaur toys do everything that you can hope from a toy which is basic nothing that you don't imagine it doing. They stand up well on their own two feet and are beautifully sculpted with long, strong legs and little two fingered arms just like the big boys and the real thing. 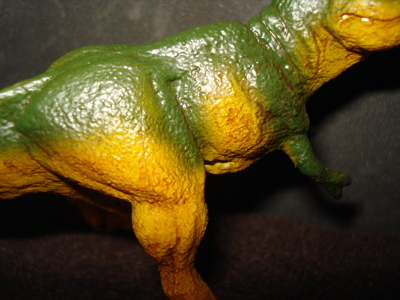 The tail(s) may be a tad over-long but that does not take away from a nice, realistic look and while the colors are very simple and basic (essentially two-toned) they can be repainted as easily as I did the Marx T-Rex below. "Your day is done, Marxists!" The "CE" on their bellies indicates that they passed the stringent Euro-Union toxicity testing protocols and can be safely eaten by children and pets. This is more easily done thanks to their (comparatively) soft-rubber material but it is not suggested or advised, if for no other reasons, than they are out-of-production, haven't any nutritional value and predators generally don't taste very good. That's as far as I'm going with this. I strongly recommend these Safari, Field Museum Sue T Rex Dinosaur toys as either gifts or for your own personal collection. They are easily transportable to fine restaurants, weddings and catered social events where they can wreak mini-havoc before slipping back into pocket or purse. Not for the faint of heart. You can learn more about the real "SUE" and the Field Museum here if you desire (opens new window). 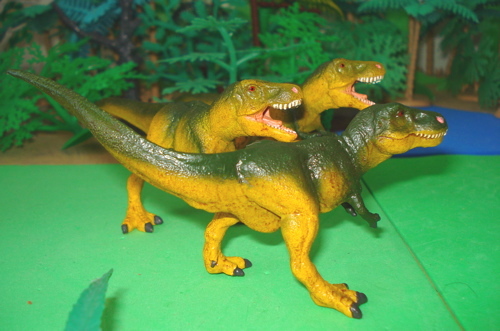 You have been reading about the Safari, Field Museum SUE T Rex Dinosaur toys. 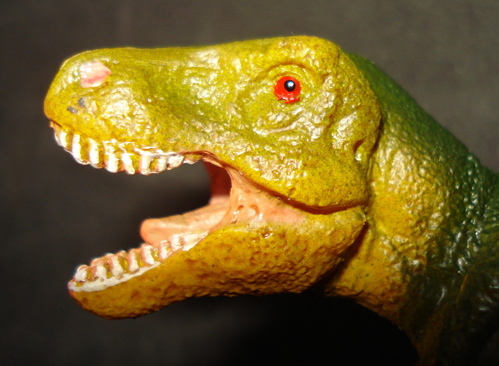 Click THIS link to return to our Tyrannosaurus Rex main page, thank you.